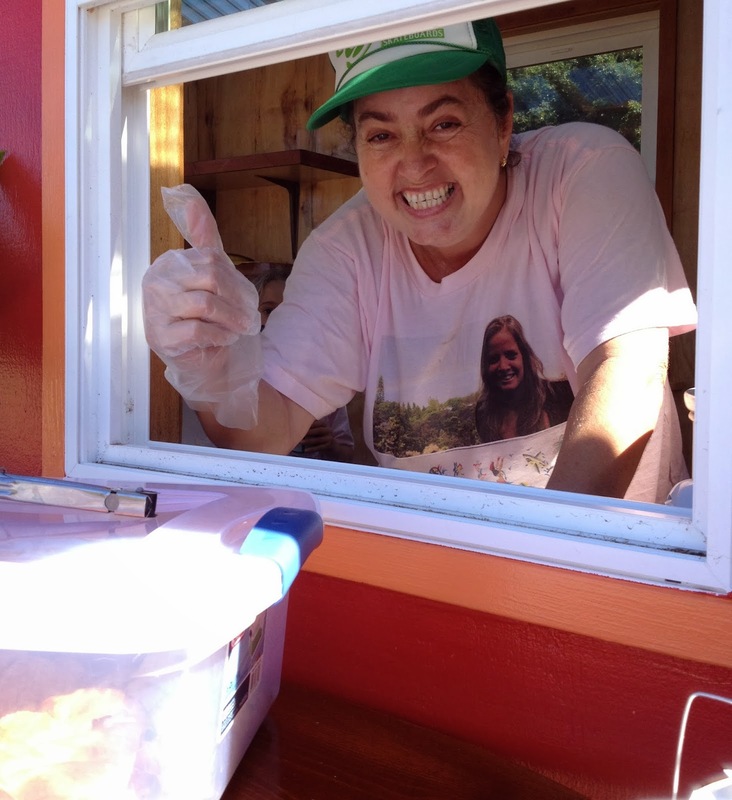 Update 8/17/14: Julie's (aka Giulia's) Food Truck is no longer on Hana Highway. A brightly painted orange caravan in a field of green. A table with pastries by the side of the highway. Three men cutting long stalks of cane grass to create more parking. Was it a fruit stand, one of many on the road to Hana? There was no sign. We had passed Twin Falls and I didn’t get a smoothie then, and I was now thinking about smoothies. We pulled over and a boy and a girl ran up to meet me. They showed me pastries and croissants on a table outside. These were store-bought. There were also two women, one older and one younger. They said they made the lilikoi mousse. 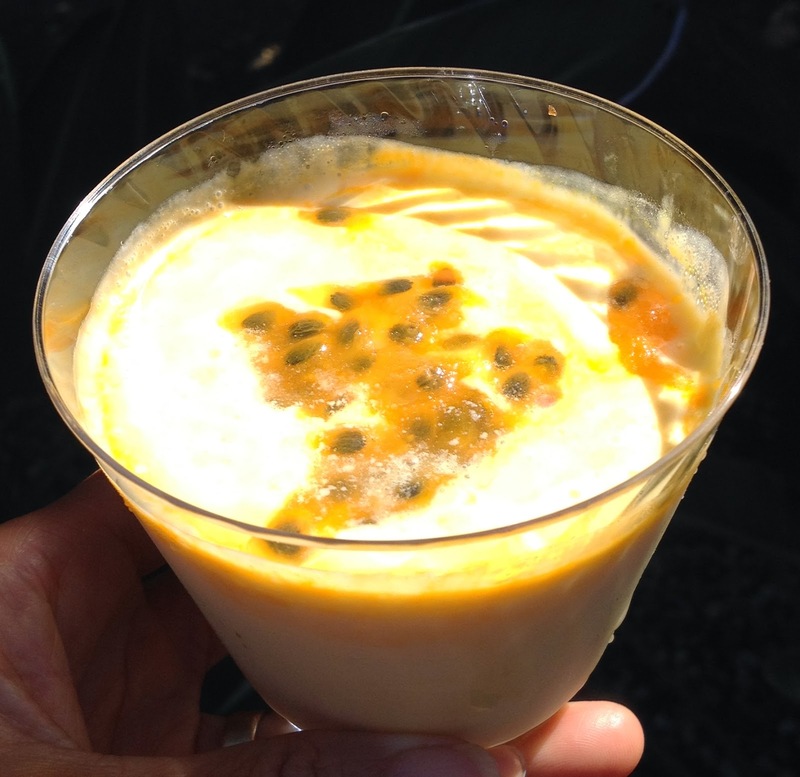 Lilikoi is passion fruit, a gorgeous, tangy sweet fruit that is as plentiful in Hawaii as zucchini is on the mainland. The orange caravan was not a smoothie stand, but a Brazilian food truck, and the two children wanted me to try everything. Since the mousse contained lilikoi, I felt obligated to sample it. Even though I have a ton of lilikoi at home. They also had more substantial food. A Portuguese black bean soup and a yellow seafood soup, both were quite good, which they plied on DH and I. One of the chefs of the Food Truck. Maui actually has a significant Brazilian population. There are not as many Brazilians as Portuguese aka “Portagee” who came here to work on sugar cane plantations, but I’ve met more than a handful of Brazilians through the years. 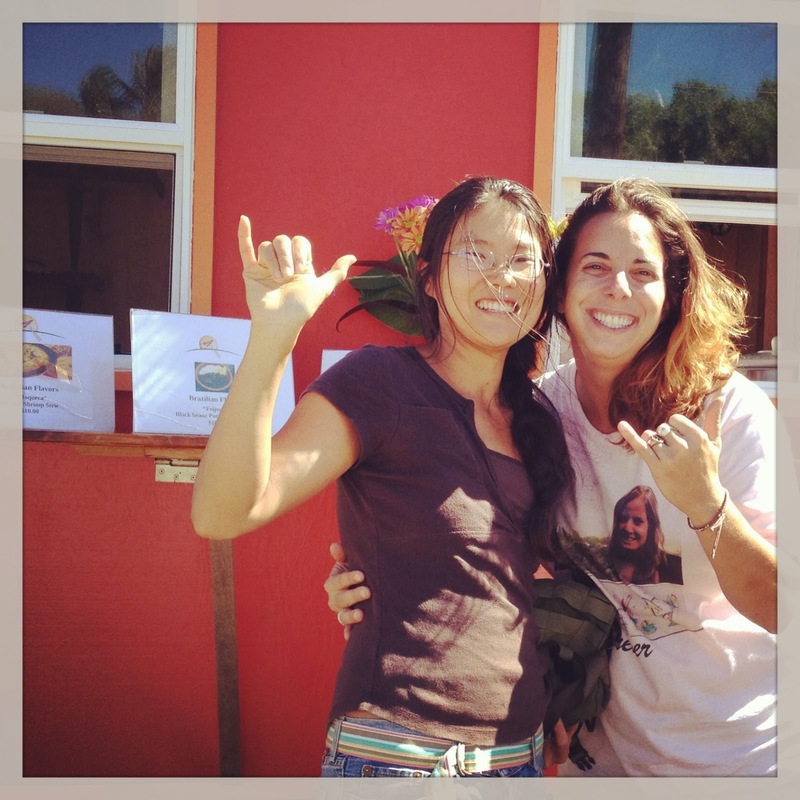 Some of them came to Maui to go surfing or windsurfing and even hit the big time. Those who stayed on Maui brought their families here. There are plenty of restaurant and hotel workers from Brazil, even a popular Brazilian jiu-jitsu studio. 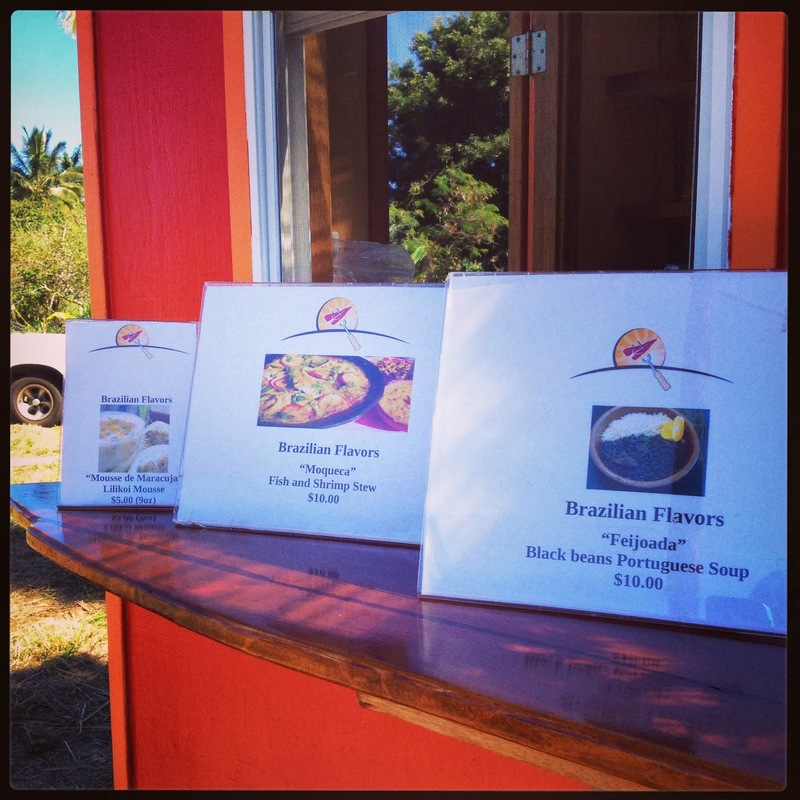 Menu and pictures of Brazilian food items. The older woman scooped some rice into a Chinese take out box and then ladled yellow soup over it, while I posed with the younger woman. Then she said she would give me the mousse for free, since I was their first customer. The name of their truck was Julie’s Flavors. “Are you Julie?” I asked both the women. Posing with one of the chefs. Dag, Julie’s mother, said they will keep the same menu for now. Days of operation: Currently, Friday, Saturday and Sunday, weather and other conditions permitting. Subject to change - remember this is laid-back Maui not NYC! Location (as best as I remember): the town of Haiku, on Hana Highway, around milemarker 15, on the mountainside of the highway, before Ulumalu Road hits Hana Highway. Languages spoken: English though their Portuguese is much better. They don't always have the food truck on the highway, so if you are craving Brazilian Food, please call them. I bet they'd be willing to cater for events too. Food trucks are great! How awesome to be the first customer and love the photo! So sad about Julie but wonderful that they are following her dream. Wishing lots of success to them. You make me want to go down this minute and find them. Sounds like they have some great soups and the dessert looks tempting, too. What a wonderful story you've written. I wonder what happened to Julie. It's so inspiring that they are doing this in her honor. It brought a tear to my eye. Judi, gosh I never thought about food trucks in Rhode Island, but of course, you would have them once the weather gets warmers. I hope they are successful too! Sunny, the dessert is great and everything was tasty. I don't know what happened to Julie. I felt uncomfortable asking. Later, I called them up and got Dag, Julie's mom, and tried to ask them some questions, like where they are from in Brazil but it was just too hard with the language barrier. I think the other gal is Julie's sister, but again, I couldn't get that confirmed. I hope they do well and don't get discouraged. Dag said that they haven't been really busy yet. right now to go track this food truck down!!! Thanks for sharing this.